First up the latest cute photo of April who is now two days old. We had to do a food shop today. Animal food shop so it’s actually quite fun. 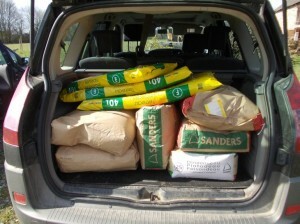 We headed out to the agricultural Co-op at La Cellette and then I watched while Chris and one of the staff lugged heavy 25kg sacks of wheat, pig complement and turkey food from the store to the car. Ever since my neck problems I’ve been banned from lifting anything heavy and I’m not complaining! We added some compost to the shopping list today for our seedlings and we would have bought lamb tail rings (sorry April, but letting Lambo keep his wasn’t a good idea so we’ll be going for short tails from now on) if they’d had any. 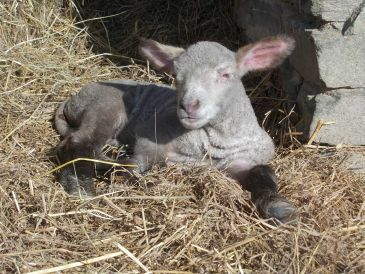 We also priced up a heavy duty sheep shearer. Our ebay special fell apart the other day. 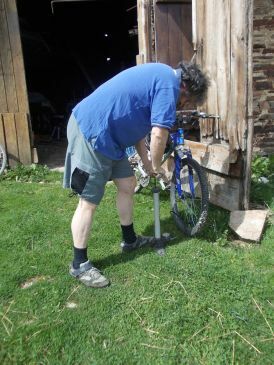 At the Sheep Fest on Sunday we saw that our farmer Edouard was using a Heiniger and if it’s good enough for a pro like him, then it’s good enough for us. We’ll get that next time we visit. And you’re right, I don’t have any turkeys currently, not even in the freezer, but this year’s batch arrive next week and I wanted to be stocked up with food for them beforehand. Usually I arrive home from the market with my poults and suddenly and guiltily realise I haven’t got any food for them and have to shoot off somewhere to buy some noms for my dindoneaux. This afternoon it was time for the great unveiling of the white legs. It was the first bike ride of the season in shorts. We had our longs on for the last ride. It’s scary how pale we get over winter. I’m even whiter than Chris. However, with this weather and a few more outings in shorts we’ll be a much healthier colour.